BulbasaurCraft is a survival orientated pixelmon server! We first opened back in march 2015 but unfortunately had to close down in august because of some complications. Now those complications have been dealt with, we've decided to open the server again! We are a survival focussed pixelmon server with features such as gyms, economy, tournaments and fun other activities! We're planning to add questing later on aswell! We're currently running Pixelmon Reforged on Minecraft 1.12.2 installing instuctions can be found on our website! Great Server, Gym's, Active Staff, Good Economy, good pokemon spawns, and even rewards for how long you have been playing. Very good server with very helpful staff. People on the server are very nice and are willing to help at any time. The server is great in general. I just started the server a day ago and I have been having tons of fun. The staff members and players are really helpful to newer members of this server. I just started playing and I have been really enjoying this and I think this server has potential to become huge one day. This server is great, it's got a very good community and very nice staff. The community will most of the time help out if you ever need anything and maybe even give some good stuff away for free! I highly reccommend this server. Helpful players and a friendly community :-) Also server runs fluently with a good amount of pokemon spawning! 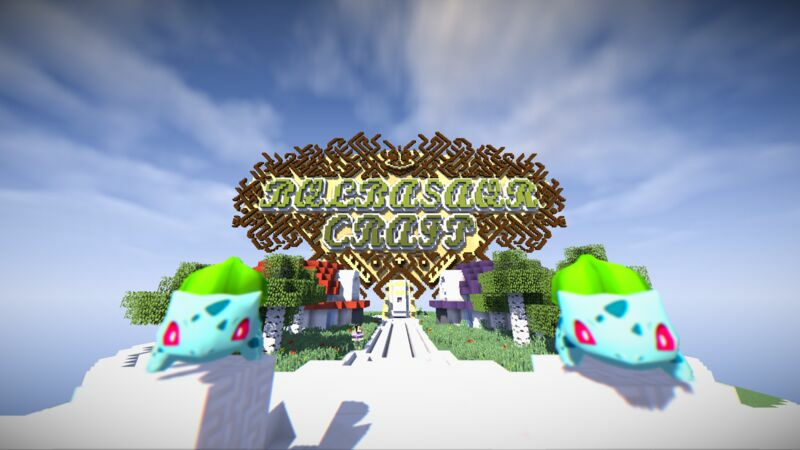 With a buzzing community you will really feel at home with Bulbasaurcraft. All the mods are really helpful and there is endless amounts of fun to be had! this is a fantastic server. the staff are incredibly helpful and all the players are really friendly. This server has alright staff and an alright community. I'll name the pros and cons of this server. -You get muted for griefing. -A lot of the gym leaders are never on. Overall this server is not recommended, it lags a lot it can't handle when one player is flying around on a pokemon generating new chunks. Honestly the server is quite good unlike some Pixelmon servers. Allowing Legend spawns is a great way to balance things out. The moderators are also very friendly and the owner CheatKodes is unbelievably nice towards players. I would recommend this server to anyone who just wants to play Pixelmon with a good community. It is cool and awesome. The amount of pokemon spawning there are better than a lot of other servers. i enjoy playing on this server as the moderators and admins are nice and helpful,so are the regular people. i enjoy having battles and givibg support to them. if i have one thing i dislike its that.... i cant actually think of anything i dislike. Nice Server, i can play with my friends and catch and train with them my pokemon and i like the spawn it looks amazing! Amazing server with friendly people. My favorite pixelmon server, Shops, Gyms, Everything you could want in a pixelmon server. Love it, and its exactly what ive been looking for. The server is great! People in the server are fantastic. The play are isn't grief'd (atleast not yet) which is great!